Repetition is often anathema to the gifted child. Curriculum compacting helps a child to move ahead to new content sooner when the child is quite clearly ready for that challenge. Compacting can be personalized to the child. When done well, compacting encourages the teacher to creatively re-visit old concepts to ensure mastery. Compacting prevents boredom and frustration. 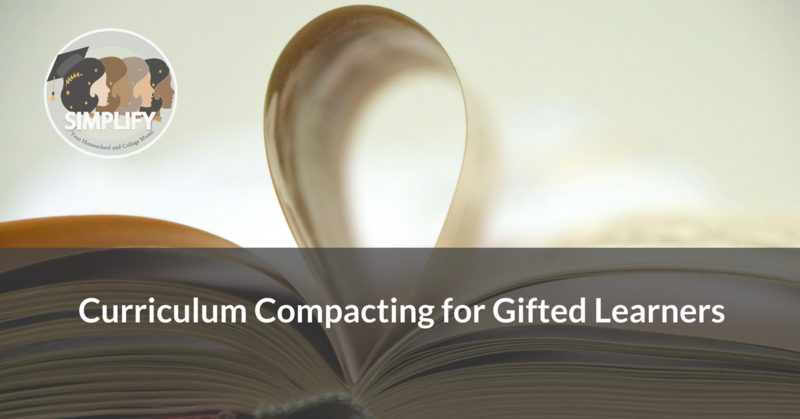 Instead of spending time assigning repetitive and unnecessary practice problems, compacting allows learners to dive deeper into concepts using more worthwhile resources. The National Research Center on the Gifted and Talented outlines 8 steps for curriculum compacting with each step broken down further into sub-steps. This makes sense when teachers are dealing with larger numbers of gifted students. The homeschooling parent, however, will often find compacting (after a little trial and error) more flexible. What topics does your child love? What topics bore your child most quickly? Is it realistic to skip ahead in the curriculum for boring topics as long as your child is not overwhelmed? Is your child finding the topics they love too easy? Are they eager to move ahead? What about each subject’s curriculum is important for the child to learn? Make a list of 5-10 key topics. Select about 5 good questions per topic and discuss them with your child to gauge readiness. Does your child struggle with specific skills even when content is easy? You could try strengthening subject-specific skills outside of class time. Does your child enjoy subject-related supplementary activities? Offer enjoyable educational activities more regularly either during or outside class time. Keep good records of your child’s progress so that you can research areas that your child needs help with. Every week, select another 5 discussion questions to gauge mastery. You can turn these questions into a quiz or a test but some children do not respond well to being tested. Gentle, Socratic Discussion might be more welcome. Move ahead to the next level once the 5-10 key topics have been covered. Continue supplementary activities if the child finds them enjoyable. When you move ahead to the next level in that curriculum, there is a very high chance that some of the topics covered earlier will be reviewed and repeated again. A well-written curriculum will introduce review with incremental challenge at each higher level. Allowing your child to progress in this way can help reduce some of the frustration that they feel with content that is already very familiar to them. We used Singapore Math, MEP, and Math Mammoth for elementary geometry. My child loved origami and I used this to teach lines, angles, and symmetry. My child picked these skills up quickly and we were able to compact these topics in the curricula used. My child loved constructions but struggled with the dexterity needed for them. So we turned to a construction-skills workbook called Hands-On Geometry by Christopher Freeman. I bought a sturdy compass and allowed my child unrestricted time with the workbook. It was a hit! To supplement this, we read mass market geometry books together (the Wooden Books series, for example, is excellent for math concepts presented in a readable style), made more origami, and watched documentaries about ancient mathematicians like Thales. We plotted squares and circles in the backyard to learn about area and perimeter as well as to study bugs and other creatures. We went into depth, applying geometry to art, history, and science. Thanks to our fun explorations, my son developed an intense passion for geometry and was confident when I posed discussion questions. In a few years, he surpassed my ability to teach geometry so we used a math tutor for high school geometry. The tutor was similarly able to compact the class and within 8-9 months, moved my son to a college-level text. To be clear, curriculum compacting will not work well if your objective is to rush a child through math. The secret to successful compacting is to see how joyful and meaningful lessons are and what you can do to make those lessons even more meaningful and productive for the child. A child who finds delight in learning advanced concepts will be happy to indulge in the challenging work that you present to them. More likely, your child will be begging you to give them the big picture sooner and will be pulling you along on the journey. By compacting geometry to the appropriate level, I was able to watch for frustration and indulge my son’s love of geometry, building much more depth in his overall study of math than I could have with a lock-step approach. If you have more questions about curriculum compacting, please contact your muses at Simplify!